Are you ready to deck the hulls? Lighted boat parades on the Chesapeake have officially begun, and we’ve got all the details whether you’re spectating or participating. December 1: Baltimore Parade of Lighted Boats. Vessels lighted up for the holidays will parade through Baltimore’s Inner Harbor and Fells Point to kick off the holiday season. December 1: The District’s Holiday Boat Parade. 6 to 9 p.m. at The Wharf in Washington, DC. Warm up by the fire pit, visit the lighted Christmas tree, go ice skating, and sample winter drinks at the Waterfront Wine and Beer Garden. Boats arrive in the Washington Channel at 7 p.m., followed by a fireworks finale at 8 p.m.
December 8: Eastport Yacht Club Lights Parade. For the past two years, the Eastport Yacht Club Lights Parade has been nominated to compete in the USA Today poll, “10 Best Holiday Parades,” and took home first place in 2016! This year’s event takes place between 6 and 8 p.m., rain or shine in Annapolis, MD. Fleets will circle in front of Eastport, the City Dock, Naval Academy seawall, and the length of Spa Creek. 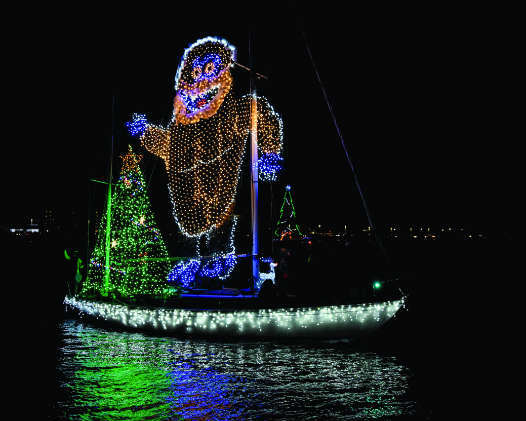 December 8: Solomons Lighted Boat Parade. Held 6:15 p.m., weather permitting, during the Solomons Christmas Walk in Solomons, MD. All that is required is to decorate your ship’s starboard side; decorate more if the moment strikes you! The parade begins at Solomons Yachting Center and heads up Back Creek, then down, then proceeds up the Patuxent River along the boardwalk before returning to Solomons Harbor. December 19: Second Annual Deale Parade of Lights. Beginning at 6 p.m. on Rockhold Creek in Deale, MD. There will be three staging areas: Hidden Harbor Marina, Happy Harbor Restaurant, and Shipwright Harbor Marina. Commercial and recreational boats of all sizes are welcome to participate. Free entry! December 1: Yorktown Lighted Boat Parade. Pre-parade festivities start at 6 p.m. at Yorktown Beach and include caroling around a beach bonfire, a musical performance by the Fifes & Drums of York Town, and complimentary hot cider. Boat parade begins at 7 p.m. in Yorktown, VA.
December 1: Colonial Beach Holiday Lighted Boat Parade. Boats in all their holiday splendor cruise from one end of the Potomac and back again! Watch from the beaches or from the town pier, 5 to 6 p.m. in Colonial Beach, VA.
December 1: 19th Annual Alexandria Holiday Boat Parade of Lights. At 5:30 p.m. Alexandria’s harbor shines as dozens of brightly lit boats cruise the Potomac River at the historic Virginia waterfront. December 7: 30th Annual Downtown Hampton Lighted Boat Parade. Activities from 6 to 9 p.m. along the downtown Hampton, VA, waterfront. Boat parade sets sail at 7 p.m. All boats must be registered by November 30. Email [email protected] for inclusion in our online calendar.